At face value (no pun intended) neither of those descriptions sounds great, but one actually is. 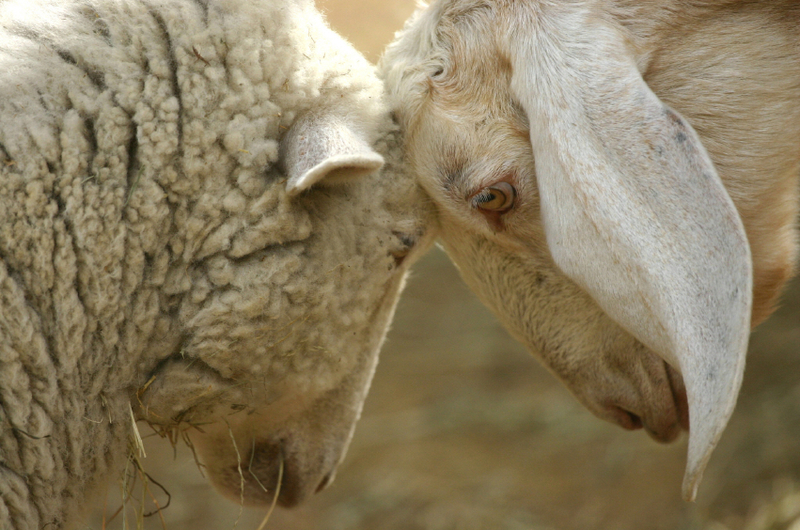 We know from scripture that sheep are symbolic of those who faithfully follow Christ and trust Him. Even in Psalm 23, we are comforted by the knowledge that the Lord is our Shepherd as He affectionately cares for us, His sheep. In Matthew 25, Jesus explains that the day will come when the righteousness of God will prevail and all will be judged. At that time, Christ will come in His glory with all of the angels accompanying Him, and take His rightful seat on His glorious throne. Depart from me, you cursed, into the eternal fire prepared for the devil and his angels. Jesus then accuses the goats of having ignored everyone in need, and not giving them food or drink, or welcoming them, or visiting them, or clothing them. For this they are doomed eternally. It is the state of the heart that appears to condemn them. We know that we do not earn our salvation by our works. We don’t gain points toward paying for our sins by feeding the poor, clothing the naked, or visiting the brethren in prison. But if our hearts are right with God, we will naturally be doing these things as that goodness flows from us. And these [the goats] will go away into eternal punishment, but the righteous [the sheep] into eternal life. This is strong—how can we do this right? According to Galatians 2:16, a person is not justified by works of the Law, but through faith in Christ … because by works of the Law, no one will be justified. There is no indication that one needs to hear the call of God to carry out this commission—we just need to be obedient. Out of our comfort zone? Absolutely! Necessary? Non-negotiable! God the Father inspired this verse, Jesus the Son said it empowered by the Holy Spirit. This is not me talking, this is the heart of God. We can make ourselves feel better for a moment by saying we aren’t called to do it, but make no mistake—it is God we will answer to on that judgment day. There is no reason to expect a mysterious calling if God has already made it a command for all. So, I must be honest with myself and ask the questions—Where is my heart? Am I a servant who goes where God leads me—someone who, without a second thought gives a cup of water, new clothing, my best coat, my car to someone in need? Or am I a person who makes myself feel better by saying, “I am willing to go wherever God tells me to go, and give whatever He tells me to give,” but never hears Him telling me to do anything? Never hears a calling? This is an important question because, according to Jesus in Matthew 25, this is a big deal. The final judgment we all face will be a time of separating the goats from the sheep. I’m going for the sheep. You? Question: Has God ever called you to do something you didn’t want to do, but you were obedient anyway? Next: A Gorilla In The Closet?